Mary Ann proposed Keythedral, Carolus Magnus, and Alhambra. I chose Keythedral. There are 2 minor problems in this otherwise excellent game. One is that the rigid starting layout of the field tiles and cottages makes for a less interesting repetition of rounds. This is mitigated somewhat by the changes in starting player, the changes in resources needed over time, the upgrading of cottages to houses, and the ability to build fences. Still, I wish players could somehow modify the layout over time (aside from the special rule that allows you to move a house if it gets cut off by fences). We decided to throw in the expansion tiles to make the endgame more interesting. This mitigates the second problem. The resources needed to complete the 12 tiles in the basic game are mostly iron, stained glass, and gold. All of these resources must be acquired by trading for them in the market. This means that the placement of workers degenerates from wanting specific resources, to just trying to get the most resources. The expansion tiles correct this problem by having, for example, 6 water, or 2 iron and a Law Card. 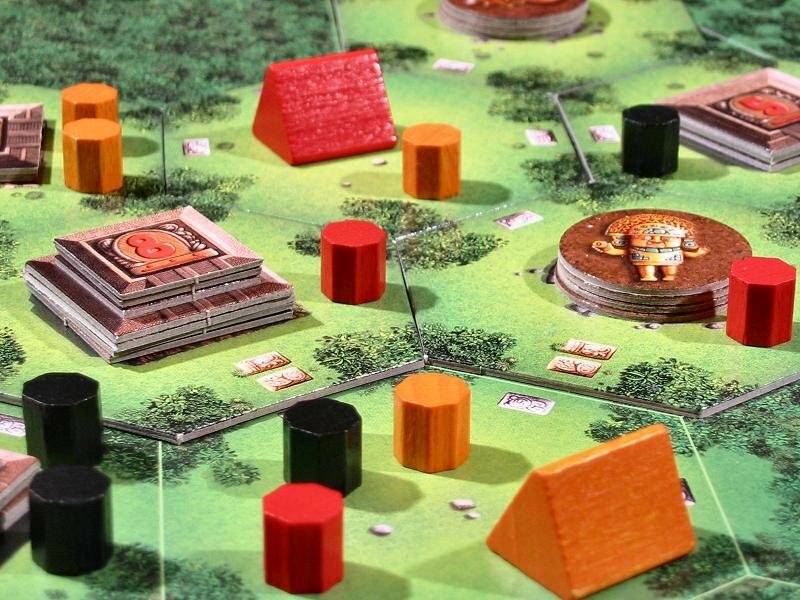 For our second game, I proposed Mexica, Tikal, and Attika. Mary Ann chose Tikal, which she had never played before. This was the first time I had played my copy; I wasn't even sure if I had punched it yet. This is one of those games where the insert looks very well designed, but that is completely inappropriate for travel. Having played Mexica a few times before, Mary Ann picked up the gist of Tikal very quickly. Surprisingly, there were no real gotcha plays other than a mildly annoying volcano she played adjacent to my first camp during the B phase. I treat all games that I am teaching as practice, so I wasn't going for the throat. That being said--and I am making no excuses--I was taught a good lesson. After the first 2 scoring rounds, we were exactly tied at 56. After the third scoring round she was ahead by 11 points. In the final scoring round, I played to maximize my score. This was a huge mistake. By doing this, I ignored the fact that I was leaving some of the larger temples vulnerable. For example, by trying to score a 7 and a 2, I allowed her to take control of the 7 on her turn. If I had given up the 2 and beefed up the 7, I would have scored 2 points less and denied her the 7. This is such a basic move that I'm certain I considered this in all my online plays. The good news is that Tikal was a hit. Next time I will add Java to my proposed games.